Mangroves are trees and shrubs that grow in saline coastal habitats in the tropics and subtropics – mainly between latitudes 25° N and 25° S. The saline conditions tolerated by various species range from brackish water, through pure seawater (30 to 40 ppt), to water of over twice the salinity of ocean seawater, where the salt becomes concentrated by evaporation (up to 90 ppt). There are many species of trees and shrubs adapted to saline conditions. Not all are closely related, and the term “mangrove” may be used for all of them, or more narrowly only for the mangrove family of plants, the Rhizophoraceae, or even more specifically just for mangrove trees of the genus Rhizophora. Mangroves form a characteristic saline woodland or shrubland habitat, called mangrove swamp, mangrove forest, mangrove or mangal. Mangals are found in depositional coastal environments where fine sediments (often with high organic content) collect in areas protected from high energy wave action. They occur both in estuaries and along open coastlines. Mangroves dominate three quarters of tropical coastlines. Of the recognized 110 mangrove species, only about 54 species in 20 genera from 16 families constitute the “true mangroves”, species that occur almost exclusively in mangrove habitats. ] Demonstrating convergent evolution, many of these species found similar solutions to the tropical conditions of variable salinity, tidal range (inundation), anaerobic soils and intense sunlight. Plant biodiversity is generally low in a given mangal. This is especially true in higher latitudes and in the Americas. The greatest biodiversity occurs in the mangal of New Guinea, Indonesia and Malaysia. 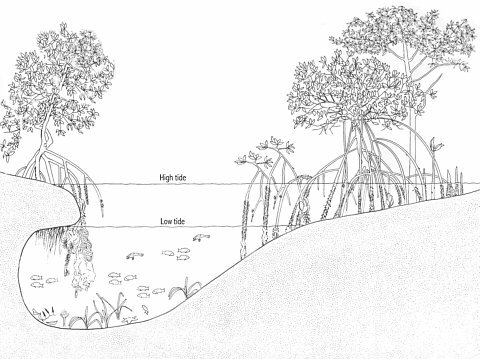 Red mangroves, which can survive in the most inundated areas, prop themselves above the water level with stilt roots and can then absorb air through pores in their bark (lenticels). Black mangroves live on higher ground and make many pneumatophores (specialised root-like structures which stick up out of the soil like straws for breathing) which are also covered in lenticels. These “breathing tubes” typically reach heights of up to thirty centimeters, and in some species, over three meters. There are four types of pneumatophore—stilt or prop type, snorkel or peg type, knee type, and ribbon or plank type. Knee and ribbon types may be combined with buttress roots at the base of the tree. The roots also contain wide aerenchyma to facilitate oxygen transport within the plant. Red mangroves exclude salt by having significantly impermeable roots which are highly suberised, acting as an ultra-filtration mechanism to exclude sodium salts from the rest of the plant. Analysis of water inside mangroves has shown that 90% to 97% of salt has been excluded at the roots. 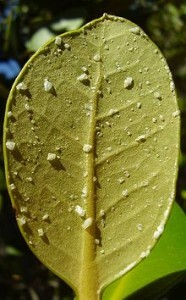 Salt which does accumulate in the shoot concentrates in old leaves which the plant then sheds. Red mangroves can also store salt in cell vacuoles. White (or grey) mangroves can secrete salts directly; they have two salt glands at each leaf base (hence their name – they are covered in white salt crystals). 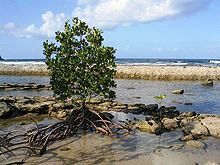 Because of the limited freshwater availability in salty intertidal soils, mangroves limit the amount of water that they lose through their leaves. They can restrict the opening of their stomata (pores on the leaf surfaces, which exchange carbon dioxide gas and water vapour during photosynthesis). They also vary the orientation of their leaves to avoid the harsh midday sun and so reduce evaporation from the leaves. Anthony Calfo, a noted aquarium author, observed anecdotally that a red mangrove in captivity only grows if its leaves are misted with fresh water several times a week, simulating the frequent tropical rainstorms. The biggest problem that mangroves face is nutrient uptake. Because the soil is perpetually waterlogged, there is little free oxygen. Anaerobic bacteria liberate nitrogen gas, soluble iron, inorganic phosphates, sulfides, and methane, which makes the soil much less nutritious and contributes to mangroves’ pungent odor. Prop root systems allow mangroves to absorb gases directly from the atmosphere, and other nutrients such as iron, from the inhospitable soil. Mangroves store gases directly inside the roots, processing them even when the roots are submerged during high tide. In this harsh environment, mangroves have evolved a special mechanism to help their offspring survive. Mangrove seeds are buoyant and therefore suited to water dispersal. Unlike most plants, whose seeds germinate in soil, many mangroves (e.g. 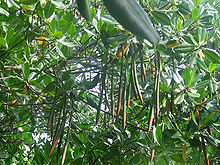 Red Mangrove) are viviparous, whose seeds germinate while still attached to the parent tree. Once germinated, the seedling grows either within the fruit (e.g. Aegialitis,Avicennia and Aegiceras), or out through the fruit (e.g. Rhizophora, Ceriops, Bruguiera and Nypa) to form a propagule (a ready-to-go seedling) which can produce its own food via photosynthesis. The mature propagule then drops into the water which can transport it great distances. Propagules can survive desiccation and remain dormant for over a year before arriving in a suitable environment. Once a propagule is ready to root, its density changes so that the elongated shape now floats vertically rather than horizontally. In this position, it is more likely to lodge in the mud and root. If it doesn’t root, it can alter its density and drift again in search of more favorable conditions.